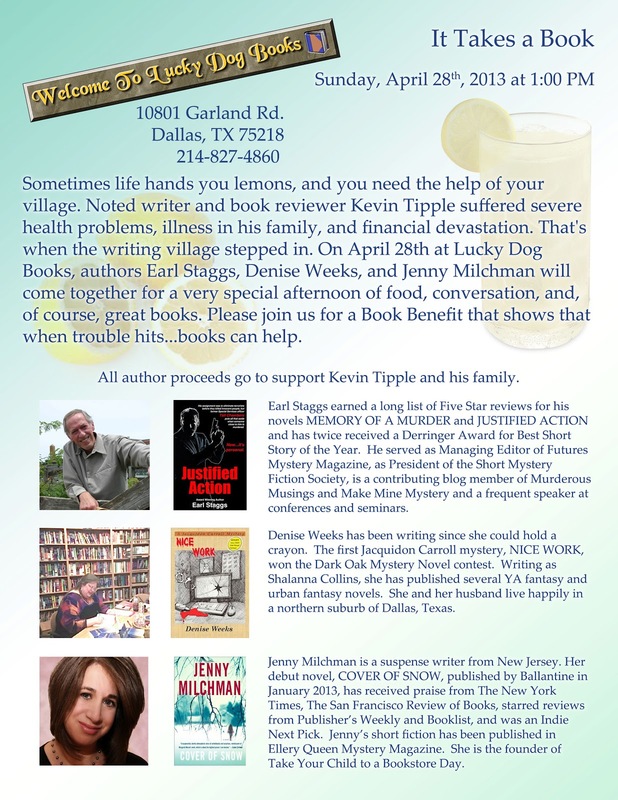 Denise Weeks, Mystery Author: DALLAS BOOK SIGNING: A Charity Event! With me! DALLAS BOOK SIGNING: A Charity Event! With me! 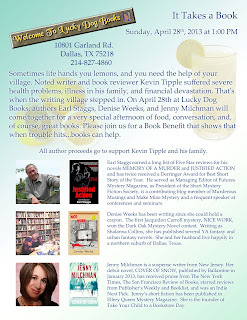 SUNDAY, APRIL 28 from 1-4 PM in Dallas, Texas: Charity Book Signing! Ever doubted my supernatural powers? Well, doubt no more. I've enticed several best-selling authors to Dallas and we're all doing a signing--for charity! Jenny Milchman, author of the suspense novel COVER OF SNOW (recently released by Ballantine Books in hardcover), will be in Dallas on Sunday, April 28, and will hold a book signing from 1 to 3 PM with me (Denise Weeks AND Shalanna Collins--you know, like Athena is also Minerva), Janis Susan May Patterson, Kevin Tipple, and Earl Staggs at the Garland Road location of LUCKY DOG BOOKS. JENNY! SHALANNA (DENISE)! EARL! JANIS! KEVIN! What's not to like?! Here's how it's going down. Jenny will speak briefly at 1 PM and take questions from the audience. We'll be collecting books from each author present during that time and putting them into a raffle basket. Then we'll have the signing! Everyone who buys one or more of our books gets a raffle ticket. We'll draw a name out of the hat (watch me pull a rabbit out of my hat!) and award the basket of books! We'll then draw ten more names, and those lucky people will get to stay after for a "Getting Published/ Craft of Writing" session with the authors. Now, about the charity part. Where will the profits go? Ms. Milchman intends to donate all profits she makes from the event to a Plano family, Kevin and Sandi Tipple and their two sons, who are saddled with medical bills and overdue rent. (Ms. Patterson and I wlll be donating a large share of our profits; we had to buy our books from those mean old publishers at almost full retail, alas.) Pretty cool, huh? Anyone who wants to help out will be welcomed with open arms. In fact, pretty much anyone who shows up will at least get a handshake and a cookie! Here's the official flyer for the event. We'd love to see you! Lucky Dog Books is about a mile or so from White Rock Lake near the Lochwood Shopping Center, located on Garland Road just past Jupiter (if you're coming from the east). The store is next to a church (in fact, I think it's located in an old church building itself) on the right-hand side of the street a few long blocks past Jupiter Road, just beyond the Casa Linda Bakery. You can reach it from the north and/or west by coming east and southeast on 635 (LBJ) and taking a right turn on Jupiter Road and then another right on Garland. 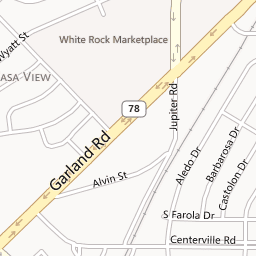 If you aren't that far north, just take Northwest Highway to Jupiter and then turn south on Garland Road. It only SOUNDS complicated. Better directions on their website.